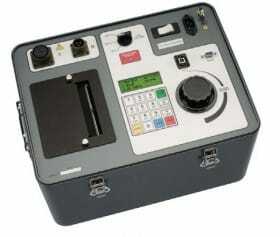 The AEZCT-10 is a microprocessor-based, current-transformer test set. This rugged and portable test set can perform the current transformer (CT) excitation, CT current-ratio, and winding polarity tests. Current transformers can be tested in their field-mounted configuration, eliminating the need to remove bushings or current transformers from the host equipment. The AEZCT-10 uses a heavy-duty transformer to perform the CT excitation test. It is capable of outputting 50 Vac at 10A, 200 Vac at 10A and 1200 Vac at 1. 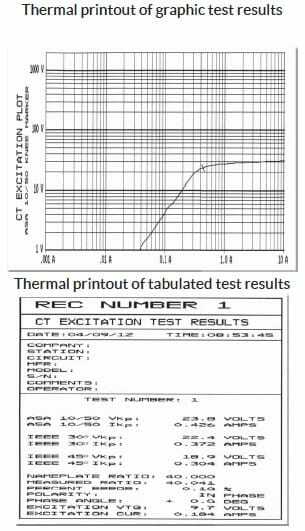 The CT excitation test is performed using the ANSI/IEEE C57.13.1, IEC 60044-1 test method. The AEZCT-10 applies an AC variable test voltage (up to 1,200 Vac) to the CT’s secondary windings. The AEZCT-10 records and displays the test voltage and excitation current applied to the current transformer during the excitation test. Once tests are completed, up to 10 excitation curves and knee-point voltages of the tests can be plotted on the built-in thermal printer. IEEE- 30, IEEE-45, ANSI/IEC 60044-1 (10/50) knee point voltages are also calculated and printed on the test report. The AEZCT-10 features a back-lit LCD screen (4 lines by 20 characters) that is viewable in both bright sunlight and low-light levels. A rugged, alpha-numeric, membrane keypad is used to enter test information and to control the unit’s functions, and a voltage control knob is used to control the variable test voltage output. The test voltage range (50V at 10A, 200V at 10A, 1,200V at 1.5A) is selected with a switch on the control panel. A built-in 4.5-inch wide thermal printer can print the current transformer test report and plot the excitation curves. The AEZCT-10 determines the CT current-ratio using the ANSI/IEEE C57.12.90 measurement method. 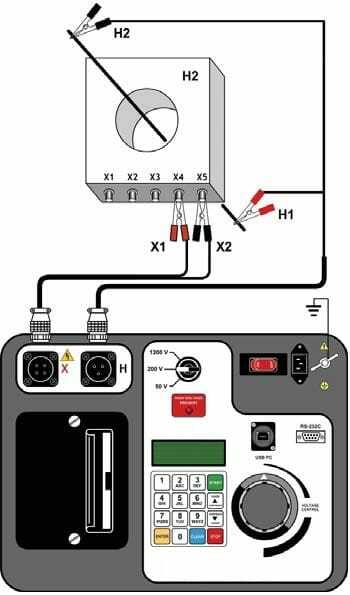 A test voltage is applied on the CT’s X terminals and the induced voltage is measured across the CT’s H1 and H2 terminals. The current-ratio is displayed on the screen and stored in memory. The current-ratio measuring range is from 0.8 to 5,000. Winding polarity is displayed as a “+” sign (in-phase) or “-” sign (out-of-phase) and is annotated with the phase angle in degrees. The AEZCT-10 can store up to 128 current-transformer test records in Flash EEPROM. Each test record may contain up to 10 excitation curves, polarity, and current-ratio test data sets. Test records can be recalled and printed on the built-in thermal printer. The AEZCT-10 can be used as a stand-alone unit or can be computer-controlled via the built-in RS-232C or USB interfaces. Windows®-based Current Transformer Analysis software is provided with each AEZCT-10. This software can be used to retrieve test records from the AEZCT-10 and can also be used to run CT tests from the PC. Tabulated test records can be exported in PDF, Excel, and XML formats for further analysis.